Myriad times a day it is murdered by novice piano students, only to rise up again. Two especially for the contemporary musician: the Classical Music pool and the Experimental Music pool. But it doesn’t seem to be going out on much of a limb to say: this Nadja Michael can’t sing. As my pace begins to pick up for this final stretch I'm finding that the increased focus and time spent working is naturally leading to my becoming a little bored with the sections I'm concentrating on most intently. Just kidding! The bros with the vinyl vision were named Emile and Joseph Berliner. My header photo shows the torchlit peace sign in Budapest during an anti-Iraq war rally in 2006 ...you have got to see this video! Clues: rollerblading, bottles, Toreador song. A graduate of the Curtis Institute, Alan performs regularly with the Chicago Sinfonietta and Lake Forest Symphony. I'm not complaining, however, because such changes in the season are all strangely comforting to this Midwestern girl's heart. This does not come entirely unsuspected—the orchestra and conductor have been considered a natural and likely fit since the news of Thielemann’s contract not being renewed in Munich first broke. At the latter, the orchestra around a core of 25 players and music director Alexander Liebreich, proved that they even play with the utmost dedication when they are just ‘hired hands’, performing repertoire not of their choosing. Liz Forgan, chair of the Arts Council, was reported to have vetoed Veronica Wadley as the Mayor of London's arts chief, on the grounds that her nomination was motivated by political preference rather than cultural commitment. This deconstructionist's delight was inspired by William Burroughs' cut-ups and spun out of my chance music project. It was created by taking the second sentence of each of the current posts in descending order of ranking from invesp.com's top 12 music blogs. 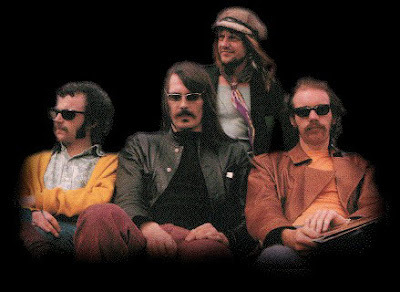 Photo shows the rock group who took their name from Burroughs' book, the 1960s band Soft Machine. They played at the 1970 BBC Proms, a performance described as 'a different experience ... a riot of noise and the smell of illicit substances!' And don't forget Sir Malcolm Arnold and the rock stars. Who mentioned naked? Why the second sentences? No, not because it conveniently makes a better join-up. As blogging is a tighter medium than conventional journalism I tried it with sentences rather than paragraphs. Reading this post was initially a very weird experience, as I follow a lot of those blogs, recognized phrases, couldn't figure out what you were up to, and wondered if my synapses had been rewired overnight. The Alex Ross post reminded me of my outlier status in reading these blogs. What fascinates me about those pieces is wondering how it is they connect with so many people. For his refined ear they're over-familiar, whereas for me that's a feature, not a bug. Like the lamas say, our minds create our realities. Lyle, it is interesting what comes out of this harmless little game. What struck me was how the source of almost every sentence can be instantly recognised from its unique stylistic signature. It does show how far we "lean" in every sentence we write and speak, and in every thought we have. And it also shows how our synpases are well and truly hardwired. Pliable - It might be that this post of Phil Ford's will interest you, at least the first four paragraphs, if how we "lean" is in some way a habit of mind. It could be just me, but there seems a Buddhist subtext to it all. You've come out and mentioned your interest, and Phil has mentioned Alan Watts several times over the years. Would add to your "hardwired" comment that all the new brain imaging studies show we can to some extent "rewire" those connections through focused endeavor. Spend 10,000 hours doing something (like attentively listening to and analyzing recordings) and your brain will have more and different wiring than others, and that you did before you started. Great to have you back posting again, speaking of "unique stylistic signatures" and content.